Now there is a more affordable 80-cell USB refreshable braille display that works with Apple and Windows computers. 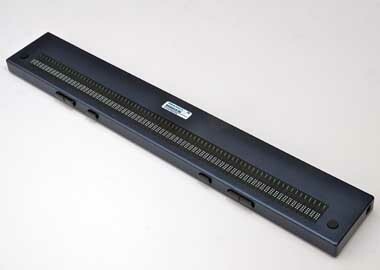 Experience the convenience of reading an 80 cell braille line at one time. This is perfect for people who spend a lot of time working with spreadsheets or accessing complicated call center screens. This product comes with a 2 year Warranty. Dimensions: 23" x 3.5" x 1"
Sign up to receive monthly product announcements. © 2013 the BraillerDepot, LLC | Over a Decade of Experience Integrating Systems for the Visually Impaired.